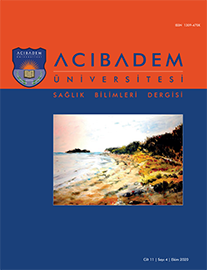 3Ege Üniversitesi Hemşirelik Fakültesi, Hemşirelik, İzmir, Türkiye DOI : 10.31067/0.2019.108 Objective: The purpose of this study was to conduct the validity and reliability study of the Symptom Management Scale for Self-efficacy and to contribute to the national literature with this scale. Materials-Methods: The study used the Symptom Management Scale for Self-efficacy. It has 13 items. The researcher primarily checked the language and content validity of the scale to do the validity and reliability studies of the scale in Turkish. Then, the Turkish scale, which was shaped by language and content validity studies, was administered to individuals with chronic diseases being treated in two hospitals. The collected data from this administration were evaluated using the structural equivalence model to test the construct validity of the scale. The reliability tests were also done using these data. Results: The Turkish validity and reliability study of the Symptom Management Scale for Self-efficacy found that the scale had favorable fit indices (?2=223.14, X2/SD=4.13, RMSEA=0.077, CFI=0.90, IFI=0.91, NNFI=0.90 and NFI=0.91), and included one dimension and 12 questions.